Unit comes with granite countertops in kitchen, master and guest bathrooms, new wood look tile throughout, window treatments throughout, walk-in tiled showers in both bathrooms. Flat screen TV's in living room and both bedrooms. Want a vacation of a lifetime in Paradise? Wouldn't you love to spend some realaxilg time in this beautiful ocean front home away from home. FREE SET OF BEACH CHAIRS (two chairs with one umbrella) for your enjoyment March 15th through October 15th. This unit is located at Watercrest Condominium Resort located on Thomas Drive. 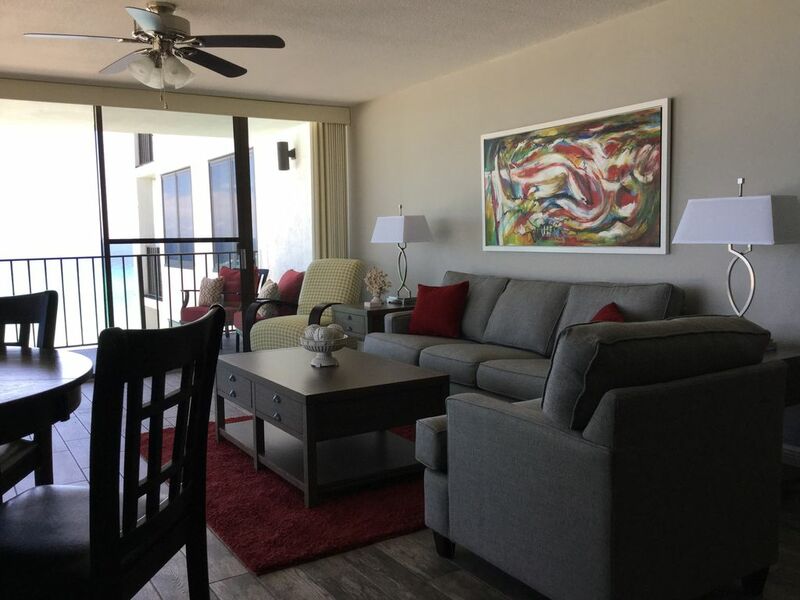 It has a large wrap around balcony with an AWESOME view of the gulf, where you can watch schools of dolphins or just sit and enjoy the tide come and go on the beautiful white sugar sand beaches. The master bedroom has a king-size bed with a private bath and also shares the wrap around balcony. The guest room has two queen-size beds with a private balcony overlooking the shuffleboard and tennis courts with a large adjoining bath. The kitchen is fully equipped and furnished with cherry cabinets. We make an extra effort to be sure our unit is clean and well equipped. We want you to come back year after year. Our guests are most important to us, we are dependant on you. Association specifies no singles under the age of 25 are allowed to rent this condo. NO EXCEPTIONS. Association specifies no pets of any kind are allowed in this condo. This is a non smoking unit. Please e-mail for more information. Your $300.00 deposit will be returned in full if the condo is left just the way you found it other than the normal cleaning! Watercrest does not allow overnight parking of any type of Trailer. There is a Parking Pass fee of $20.00 Dollars per vehicle for entire length of stay. Limit two vehicles only. Private elevator from 1st floor to 6th floor only. Kiddy Pool, Hot Tub, Men & Women Exercise room, No Smoking Unit, ABSOLUTELY!! NO SPRING BREAKERS!!! FAMILIES ONLY!!! No Pets. Safe is provided for your convenience. We had a fantastic time and it was a great condo and location. We would like to stay here again. We just returned from a week stay in PCB. The location is right on the beach with amazing views. The unit has a wrap around balcony which is great for sunrise and sunsets! The condo is immaculate and comes with everything you need for your stay! The bedrooms are large with tons of closet space and the beds are very comfortable. You definitely feel like the owner took special care to make this as welcoming and comfortable as possible. We will most certainly return and would be happy to stay here again! This was our third year staying in this condo. We love the view and the condo is always nicely furnished and clean. Looking forward to returning next year. Excellent Condo, Location & Host. Excellent condo, location and host. Will rent again or extend our stay longer. You too will love this place. We except most major credit cards. A rental agreement must be signed and returned upon confirmed booking. WATERCREST requires a one time Parking pass fee of $20.00 Dollars per vehicle. The first parking pass will be added as a separate cost to the unit. If a second Parking Pass is needed $20.00 Dollars will be deducted from your security deposit when returned back to you. Limit of two vehicles only. Check In Time Is 5PM Central Standard Time.